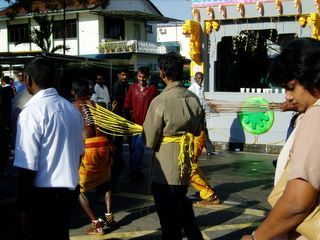 Thaipussam festivities are going on currently. 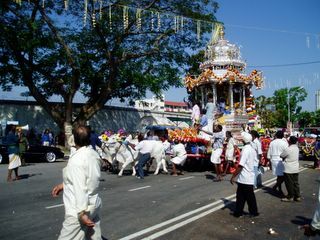 Thaipussam, a major Hindu holiday for Indians here, itself is only 1 day - the 25th, but there are festivities going on the day before and the day after. 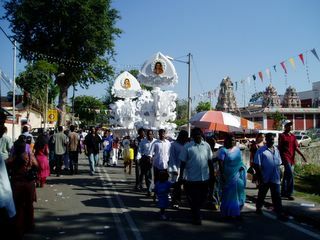 The day before, a chariot travels from one temple to Lord Murugan's temple up on a hill. On the day after, it returns. During Thaipussam, promises are made to Lord Murugan for things he does for the people. These promises include carrying milk to him, shaving one's head, or even being pierced and carrying a cavaty for him (look at the pictures for what a cavaty is). This is a very heavy place to be, as you could imagine. Distant cavadies that are worn on the head. The carriers of the cavadies will have hooks pierced from their faces and sometimes chests. At the end of the hooks are small jugs of milk. 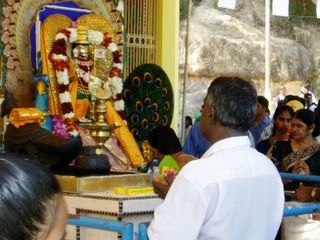 A man asking for Lord Murugan's blessing as he offers flowers and foods in a coconut shell. Piercings done on the back. Piercings are also done through the cheek, on the face, and on the chest. The chariot that travels from one temple to the other, it holds the idol of Lord Murugan. 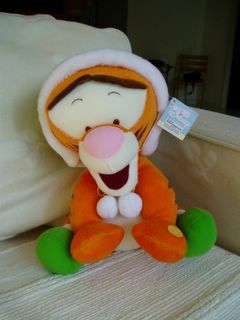 My Tigger doll from Umma's family - now I know you wanted to see this! 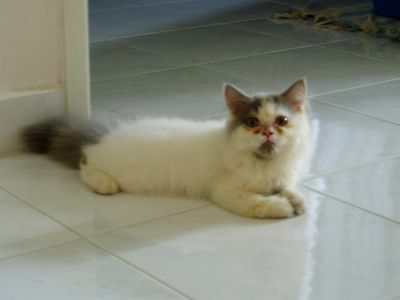 Yeah, so I fell for this little kitten. I saved her from certain death. Her name is Nambikai, which is Tamil for Hope. She likes to slide across the tile floors! 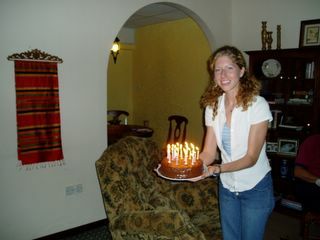 My birthday cake...mmm..am I really that old? Thank you so much, everyone, for sending me greetings and blessings on my birthday. It really meant to much to me!!! Umma invited me over to her house for a grand birthday lunch and they gave me a special Tigger doll. Later that evening, we went over to her boyfriend's house because it was his birthday, too, and we had another great meal and cake. That is a lot of food for one day. The next day... I was invited over to another friend's home for pizza and a made from scratch cake!!! It was soooo good. And you all know how I feel about pizza and chocolate - it was great! Well, I have been able to spend some good time with Umma lately. It has been so good to catch up and just hang out with someone my own age here. Today, I was actually able to catch another of my Indian friends, who also works for Starbucks. He was extremely helpful in pointing me to the right areas that I will be "researching." It is really neat how everything has come together. A day in the life... I was driving again today, yep - no accidents yet, though it is amazing how small a space one can squeeze a car! But anyway, I was wondering as I came upon a wonderful traffic circle, why everything was stopped up. Well, who would have guessed but it was a bunch of cows traveling through a rather busy part of town. Talk about something out of context...! I was able to spend a lot of time with Umma this afternoon/evening/night. We caught up up nearly everything, but I'm sure there is more to remember! I stopped by to see her at work (I only got lost once), and ended up spending 5 hours, 2 drinks, and 2 shared cakes there! Crazy! I was able to meet and talk a lot to her co-workers as well, it was soo much fun. It is so great to have the companionship, she is truly a dear friend. Ok, so, I know that I am going to be stared at. I'm tall, blonde, white, and in an asian country. This morning I decided to venture out to see where the closest wet market was to my house. Well, I found it. It was about 10:30 am so I knew there wasn't going to be much by the way of food out anymore, but I just wanted to see. The staring reality met me when I walked to the back of the market, where no tall, white woman has dared to venture before. It was in the form of a young Chinese man with a dropped jaw, seemingly oblivious to the fact that I was a living breathing human who acknowledged the reaction. I laughed to myself and went on - maybe I'll wait a couple days before shocking the young man again! Another fast day leaves me more experienced behind the wheel of my "new" car. Though driving on the opposite side of the road was thoroughly exciting and at times frighteningly eventful, fortunately I experienced no crazy accidents or hit 'n runs! Today also left me with a really cool hand phone (cell phone, in country), so I feel as though I am slowly moving back to modern society after these few days away from technology. Setting up the apartment hasn't been too much work, however today I realized that the vast majority of the cds I own were stolen from one of my trunks on the way over - thank you security checkpoints! A highlight of my day, however, included seeing where my people group lives within the city. I was shown about 5 huge buildings in which many supposedly live. The task is great, but you know Who is in control! I am here. A long and short journy has brought me to a place I would have never imagined living for so long. I remember months and months ago only just thinking about the possiblibity, but quickly trying to get it out of my mind because it scared me to death. Some things don't change - I'm still scared to death, sitting here by myself in my bedroom, in my apartment, in this country. Do I doubt in this situation? Momentarily, I do. I know better than to doubt what has been soo clear in my life. I am forced to cling to the Lord - and I know He enjoys that. Starbucks is wonderful, you know. I was walking through a mall and noticed the Starbucks and decided to look over. Who did I see, but Umma, one of my closest Indian friends. I didn't know she had begun working at this store (since there are 5 going on 6 here on the island! - you know that 700,000 people have to get their coffee fix somehow). Sooo, crazy!! But so good, I surprised her really good because I hadn't been able to get in touch with her to tell her that I was coming! Her friendship means a lot to me, and I know God will use it in a powerful way. Wow, after all the preparations, I leave tomorrow. This whole week has been a roller coaster of emotions. As I was packing and organizing the final few things today, I found myself looking through photos of these last months and even years of college and was again reminded how I have been blessed. In all the chaos that runs through my emotions I am reminded that none of this packing or moving or distress of saying goodbye is about me -- it is all about Him! As soon as I think about that I feel a peace that stands unshaken by situation. Isn't the Lord good? !